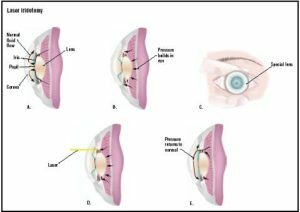 Laser iridotomy is a laser procedure that makes a small opening in the iris (the colored part of the eye) to relieve increased eye pressure due to a type of glaucoma called angle-closure glaucoma. When the fluid that normally flows in and out of the eye cannot drain through its sponge-like drainage system, called the trabecular meshwork, pressure inside the eye (intraocular pressure) may rise. This rise in pressure could damage the optic nerve and lead to vision loss. iridotomy is also performed as a preventive treatment in eyes at risk for angle-closure glaucoma. How do I prevent an angle-closure glaucoma attack? iridotomy may be recommended to prevent an angle-closure glaucoma attack. of fluid between the iris and lens. People of Asian or Eskimo ancestry have a higher risk of developing angle-closure glaucoma. Age and family history may also be risk factors, and women are at higher risk than men. your doctor may recognize your risk for angle-closure glaucoma before you experience any symptoms. If pressure is not relieved within a few hours, there may be permanent vision loss. What can I expect if I have a laser iridotomy? A laser iridotomy is usually performed as an outpatient procedure. Your ophthalmologist will give you eyedrops to numb your eye and place a contact lens on your eye to precisely focus the laser. A laser iridotomy takes only a few minutes. You may see a bright light like a photographer’s flash. You may also feel a pinch-like sensation. In general, there are no activity restrictions following the laser treatment, although you should have someone drive you home after the procedure. upper part of the iris, which is covered by your upper eyelid. The iris may be difficult to penetrate, requiring more than one treatment. A second procedure or another type of surgery may be required. A blood vessel in the iris may bleed. Medications may still be necessary. Laser iridotomy is a safe and effective procedure with few risks. While glaucoma treatments cannot restore vision already lost from glaucoma, early detection and treatment of glaucoma offers the best chance of preserving your vision.